What's next... cats in bell towers with guns!?! Where is Kitty, btw. Haven't heard from her in ages. I want one of those!!! Where can I get a calendar even if I can't have a squirrel ho. 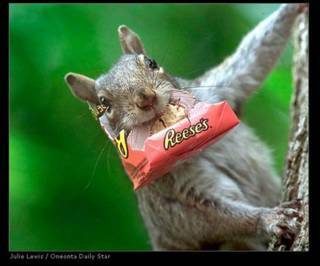 yeeeaaaah...ya know, when the link reads "sugar bush squirrels"...suddenly i find i have something to do in the other room. anything that doesn't involve clicking said link. makes me powerful hungry, I tell ya! Hey, Skunk! How ya' doing? I'm doin fair to middlin I reckon. Kinda disappointed them Scientist folk run me off like they did tho. I was hoping to get to party with the likes of Tom Cruise and such, but after they finally let me go to one of their fancy meetings, all they wanted to do was talk. And I mean talk. Alla time going on about complicated stuff about how your soul or something was in charge of your mind and body. They hooked me up to this E-meter thingy to test for engrams and said I broke their machine. Got all huffy about it like it was my fault. Shoot, all I wanted to do was maybe learn some cool science stuff like on Nova and party with some celebs. What's wrong with folks anyways? Why do all these kinda folks take stuff so serious-like? So screw them Scientologogest folks, I say. I'm laying in supplies for a good week-long bender, then maybe see if I can get my old job back packing books for Taco Bob. btw - When I left to join the cult, I give all my worldly possesion away. Imagine my surprise when I come back home and found everthing I give away is back! Somebody said it was because I didn't have nothing nobody wanted, then again it might just be cuz my place is on the way to the landfill. HA! You SLAY ME, Skunk! Funny stuff...lol. I can't wait until the next book is due...I am just waiting. I was also in San Francisco at the same days while you were there. I got stuck in traffic more than an hour becasue of the San Francisco Bike Grand Prix. I was also at the Japanese Garden in the San Franciso Golden Gate Park. I even have similar pictures you posted on the Blog. Funny thing is I went there right after finishing the Bloodsucking Fiends (Last book of my Chris Moore Collection). I kept looking out for the Emperor and His men. I have been to San Fran few times but this was the first time I visited the Japanese Garden, Dutch Windmill, Archery field, Sausalito and the Muir Woods.